Dealing with the 49″ Syntactic Foam Float on the back deck. For most of us in our daily lives we think of our world in three dimensions. We need to get up out of bed, across the floor, and through the door to the kitchen to make the coffee. But when it comes to observing the physical nature of planet earth what is happening at a given location in three-dimensional space is only half of the story. As part of their training one of the fundamental skills an oceanographer learns is to think beyond three dimensions, to include time and the change at a given location over time in their scientific perspective. It’s not enough to go somewhere and have a look just once. Without gathering data and building computer models in this fourth dimension we wouldn’t know that the sea-ice at the very spot in the ocean we are floating on at the moment has changed rapidly over the past twenty years. Mike Gregg , Matthew Alford, and Gunnar Voet at the wire. So scientists talk about things they are observing in terms of space and time, scales of ocean measurement that fundamentally define how rich or spare their digital libraries of data become. And how well sea-going oceanographers can see things over these scales are ultimately dependent on the scientific gadgets in their tool box and which ones they choose to put into water. 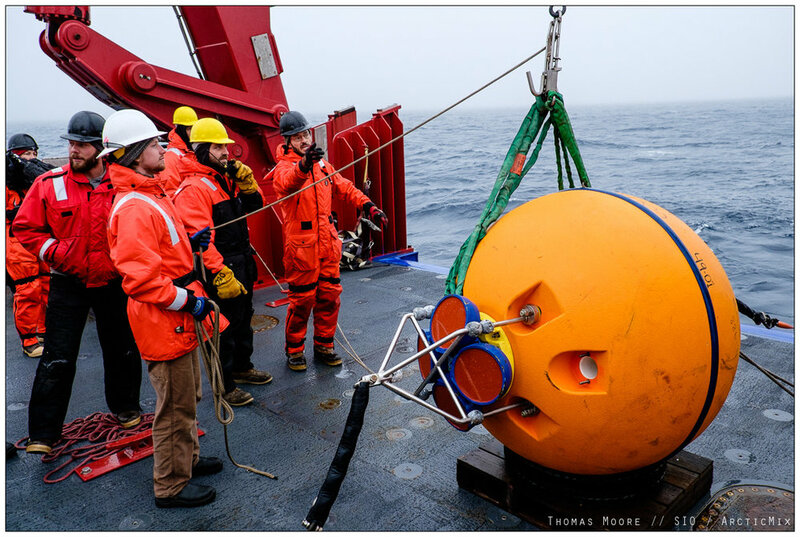 A mooring is a towering string of scientific instruments thousands of metres tall supported by giant floats at the top and held to the seabed by a beefy weight. And on this mooring, this undersea science station, we put robots. Crew of the R/V Sikuliaq ease a MP robot over the side. Deploying an ocean mooring in over 3000 meters of water is no mean feat, it is one of the bread and butter professional competencies that a group like the ArcticMix team must have and work relentlessly to maintain. A highly technical and often hazardous operation that can take many hours on the back deck of a ship like the Sikuliaq, mooring deployments are often exposed to whatever weather and waves the sea decides is right for the occasion. This voyage the weather and seas were mostly kind and the ArcticMix mooring was happily fastened to the mud on the bottom of the Beaufort, its top float suspended in the ocean currents a bit like a giant balloon on a string swaying in a watery breeze. Before the anchor is dropped the top floats of the ocean mooring trail behind the ship. Attached to this mooring are unique, recently developed ocean instruments called McLane profilers (MP’s). MP’s are “wire-crawlers”, programable robots that descend and climb the mooring wire over and over and over again, one million metres worth of travel in their large internal lithium battery packs. These profilers come jammed with an array of instruments that measure pressure, temperature, salinity, and most importantly current velocity across a longer vertical reach than any other tool in our oceanographic toolbox. The following figure, calculated from MP data collected in the South China Sea in 2007, shows the kind of ocean current information that can be measured as time passes. Scientists call it a “time series”. While the ArcticMix team aboard Sikuliaq spends the coming month exploring elsewhere, our mooring, fixed in one location, can observe ocean parameters over a long period giving us a base of consistent information to anchor the wider story of Arctic change.